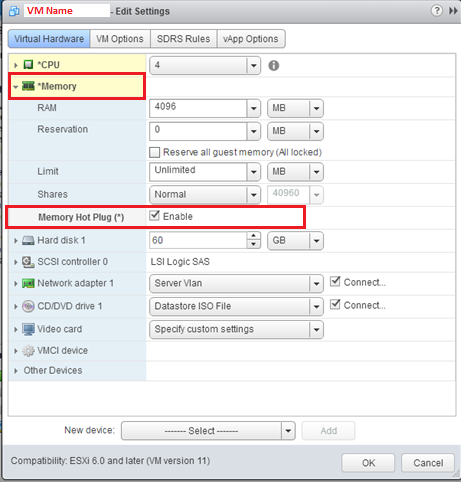 Techies Sphere: How to enable CPU/RAM hot add in VMware vSphere 6.0? 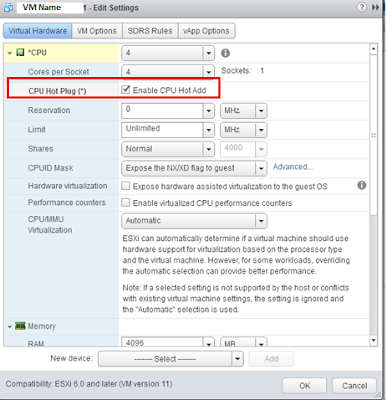 How to enable CPU/RAM hot add in VMware vSphere 6.0? Or, How to enable CPU/RAM hot add in VMware? Or, How to add CPU/RAM in Virtual Machine in Powered on Status in VMware? Description: To be able to add CPU or RAM resources in a VMware Virtual Machine, you first need to enable the “Hot Add” feature on the Virtual machine. Below steps will show you how to enable “hot add” of CPU/RAM resources for a virtual machine. Please note, if you want this “Hot Add” feature to be available on your all Virtual Machines, you have to enable this on Virtual Machines individually. Also, please check if your VMware licensing allows this feature to be enabled. Login to vCenter Web Console > Shutdown the Specific Virtual Machine on which you are going to enable this “Hot Add” feature> Edit Virtual Machine > Go to Virtual Hardware tab > Click on CPU or RAM > Find out the option CPU Hot Plug (*) or Memory Hot Plug (*) > Enable Check Mark on Enable CPU Hot Add or Enable for Memory hot add > Save the settings > Power On the Virtual Machine > Try adding additional CPU or RAM resources to the Virtual Machine, It should work..
You may refer the below screenshot for your reference to see where to find out these above stated options.